French President won't rule out new sanctions on Iran over its ballistic missile program, but reiterates nuclear deal must not be canceled. 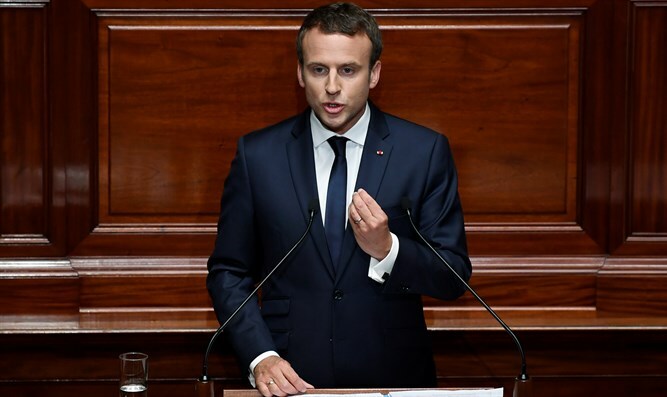 French President Emmanuel Macron on Thursday said he did not rule out new sanctions on Iran over its ballistic missile program. According to the Russian Sputnik news agency, Macron said Iran's ballistic missile program was "very worrying" and said additional measures against the Islamic Republic should be included in the 2015 Iran nuclear deal, which should not be canceled. Meanwhile, in a separate interview with Time magazine published Thursday and quoted by AFP, Macron warned that U.S. pressure to renegotiate the Iran nuclear deal could push Tehran into deciding to build its own nuclear weapons. The French president and other officials in the country have repeatedly stressed they believe there is no alternative to the landmark 2015 nuclear deal between Iran and world powers, despite President Donald Trump's refusal to recertify Iran's compliance with it. If the U.S. abrogates the Iran deal, Macron said, it will backfire. "Because it's exactly what we experienced with North Korea. And suddenly you will wake up in ten to twelve years time without any control, but (Iran) having the nuclear weapon," he told Time. EU member countries Britain, France and Germany remain firm backers of the Iran nuclear agreement and have criticized Trump for threatening to scrap it.